Reading List | What Are You Reading? Each year we pick our favourite books that we can’t stop recommending to people. Check out our 2017 list below! You can also download a BCLA Best Bets 2017 (2). This book will make you uncomfortable. It certainly made me uncomfortable. It will make you question the world and yourself. The strength of it lies in the author’s refusal to force a view or opinion on the reader. Greenwood simply tells the story in beautiful language and brings the characters to life so vividly they live in your memory long after you close the book. It is up to the reader to pass judgement, to feel and react. The eclectic “Amazing Telemachus Family” is made up of three generations of psychics, telekinetics, and con artists who find themselves facing all sorts of problems- from navigating their powers, to mob bosses, to 1990s AOL chat. Weaving together many storylines, the novel is a hilarious and heartwarming look at love and family. I’d recommend it to anyone who liked Cynthia D’Aprix Sweeney’s The Nest and also appreciates a healthy dose of weirdness in their books. Reminiscent of Where’d You Go Bernadette, this story is written in the voice of 12 year old Elvis Babbitt as she grieves the loss of her mother. It is a poignant story that is simultaneously achingly sad and utterly hilarious. Highly recommended. A fantasy novel leagues ahead of others, The Fifth Season is set on a continent under the constant threat of apocalypse via natural disaster. Some people in this world, including the main character, have the gift or curse—depending on how you look at it—of being able to move and control the forces beneath the earth’s surface; in other words, they can stop or cause natural disasters. The world-building is amazingly inventive and complex, the cast is full of complex, fascinating characters (human and sort-of- human), and the plotting is deftly crafted, with a few brilliant twists. How much is your happiness worth? In this slim novel, Swedish author Karlsson imagines an initiative that calculates the “Experienced Happiness” (E.H.) of each person in the world. Those who have experienced greater than average happiness must pay into a fund which will be redistributed to those who have experienced less happiness. Our protagonist has been assessed with a massive E.H. bill, which vastly exceeds his earnings as a part-time video store employee. This modern parable is gently satirical and thought-provoking. While these do each stand on their own, the three of them pack a powerful punch. King puts his hand to hardboiled detective fiction style with some nice twists that look back at his previous work in horror. Strong, unique characters and chilling climaxes in all three novels make for a ‘don’t put it down’ kind of read. Great to have a title that has multiple hooks for our varied library users! Olivia Laing approaches the topic of loneliness in one part memoir and one part art history lesson in these beautifully poignant essays that explore the subject through artists and the city of New York. A thoughtful and relevant work that allows one to examine what it really means to be lonely in an urban landscape and how it’s changed through society and technology in an ever increasing connected world. Bernadette has spent 40 years as a nurse living on the West Coast of Vancouver Island on the periphery of a remote First Nations reserve. As she faces her retirement and imminent move from the community, she is forced to explore her relationships with the people and place she has grown to deeply love. With an unreliable narrator, an intricate structure, and a remote and bleak Scottish highland setting, it’s not surprising that this book was shortlisted for the 2016 Man Booker. Set in 1869 this novel tells the story of Roderick Macrae who provides the reader with a memoir written while in jail, and plenty of insight into the brutal living conditions that Scottish crofters faced. Was he guilty or insane? You’ll have to read the book to find out. Moor takes a question with what seems like an obvious answer “Where do trails come from?” in the middle of walking the Appalachian trail and brings the reader along with him for a fascinating exploration of history and humanity. A delightful, immersive reading experience and not to be missed. Politics, feminism, family, and pop culture are examined by Gen X’s columnists Caitlin Moran in Mornanifesto. This book will make you laugh out loud, ponder important issues, and maybe even shock you once or twice. If fiction and non-fiction worlds could merge, Caitlin Moran would be Bridget Jones’ funniest and smartest friend. Comedian Trevor Noah was born to a black mother and white father in South Africa in 1984, when it was against the law for a mixed-racial couple to have a child together. In his biography, Noah describes growing up in apartheid South Africa, being raised by his strong-willed and resilient mother. His tales are often humorous and the reader gets a glimpse of a child growing up in a very different cultural environment. What is truly unforgettable are the harrowing stories Noah tells about living with the restrictions of apartheid. Dale Smith, a freelance journalist in the the Canadian Parliamentary Press Gallery, has done us all a tremendous favour with this 100-page primer on Canadian parliamentary democracy. His mastery of the material makes the book engagingly limpid, while the punchy argumentative style will help novices immediately appreciate the principles behind the various parts of our political system (even if they ultimately come to view some issues differently than Smith.) To achieve true accountability, democracy–which encompasses much more than elections–requires a broadly distributed command of the basics of civic literacy. “The Unbroken Machine” brilliantly deploys the book format to support citizens in performing this function. Poetry can seem intimidating, especially if you were scarred by it in english class in high school. But Michael V. Smith’s latest collection of poems, “Bad Ideas” (2017) is very accessible and richly rewarding: reading his poems feels like watching a beautiful rainbow, his words wash over you in waves of colourful emotions – joy, sadness, grief, and humour. His poetry is not weighed down by oblique references or excess verbiage: he speaks plainly and from his personal experience dealing with family trauma, lost loved ones and long-distance friends. Bad Ideas is a great introduction to poetry in the 21st century. A clear, precise, and unflinching series of essays on the diversity of indigenous issues in Canada, from blood quantum to two-spirit to the Sixties Scoop. Chelsea Vowel, a blogger, lawyer, and educator, writes with a sharp, informative, and entertaining voice. Challenge yourself to pick up this accessible and absorbing book. This entry was posted in Best Bets and tagged Best Bets, best bets 2017, Reading List on October 17, 2017 by stephanieisyourfriend. Burnaby Public Library celebrated its 60th anniversary this year. We held special events throughout the year, including a Readers Advisory presentation called Retro Reads. Our staff selected books that were either written from the 50s until the 2000s or contemporary titles where the stories took place in that time period. This entry was posted in Booktalking and tagged booklists, Burnaby Public Library, Reading List on October 26, 2016 by Ana Calabresi. Black History Month, also known as African-American History Month in America, is an annual observance in February in Canada and the US for remembrance of important people and events in the history of the African diaspora. The CBC’s 10 Books to read for Black History Month. The Guardian’s Black History Month reading list. Flavorwire’s 10 recent nonfiction books to read for Black History Month. NPR’s reading list of black letter collections. The Village Voice offers 10 Lesser-Known Books About Race. HuffPo’s 14 Books to Read This Black History Month. So tell us, how are you celebrating Black History Month at your library? -Heidi Schiller, North Vancouver City Library. 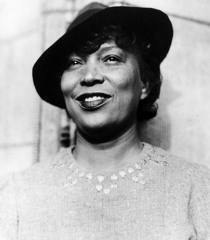 Image of Author Zora Neale Hurston via. This entry was posted in Displays, Genres, Marketing and Promotion, RA Tools and tagged African Canadian, Audiobooks, Black History Month, Canlit, February, Reading List on February 10, 2015 by nvcllibrarian.